Carbondale PA Water / Mold / Asbestos / Radon Experts! • Carbondale was the location of the first deep vein anthracite coal mine. • The area that later became Carbondale was originally developed by William and Maurice Wurts of the Delaware and Hudson Canal Company. • According to the 2010 Census, the population of Carbondale is 8,891 people. • During the coal mining boom, Carbondale's population was over 23,000 people. • On October 9, 1829 the Delaware and Hudson Gravity Railroad, the first commercially successful railroad in the United States began operation; connecting Carbondale with Honesdale. 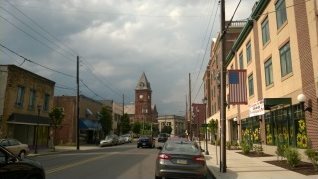 • Incorporated on March 15, 1851, Carbondale is the fourth oldest city in the Commonwealth of Pennsylvania. • Carbondale holds an annual festival every summer called Pioneer Days, in honor of Carbondale's nickname, "The Pioneer City". The festival features local bands, arts and crafts, carnival games, festival food, and a huge fireworks display. • Robert Wood Johnson I, the founder of Johnson & Johnson. • William J. Goebel, The 34th Governor of Kentucky, serving 3 days before his assasination. He is the first sitting Governor to have been assassinated.